This image The Baking Shelf just ooozes home for me, my Mam is the most amazing cook, and Sunday mornings when I was at home was a big baking day, Mam made all of our bread and we had bowls of rising dough all over our house on that day, cakes, fruit tarts, scones, meat pies, coconut haystack oh and a jelly jubilee which was the cup cake with the top dipped in jelly then rolled in coconut then sliced in half with a good dollop of fresh cream in the middle, mmmmmmm. The digital stamp The baking Shelf can be bought here. Superb card ! love it !! A down memory lane card for me Jak it is lovely. Great card Jak and those Jelly jubilees sound so scrummy! Oh HAPPY DAYS, IN A GENTLER TIME. Smashin' card Jak. Hmmmmmmmm it all sounds totally scrumptious! 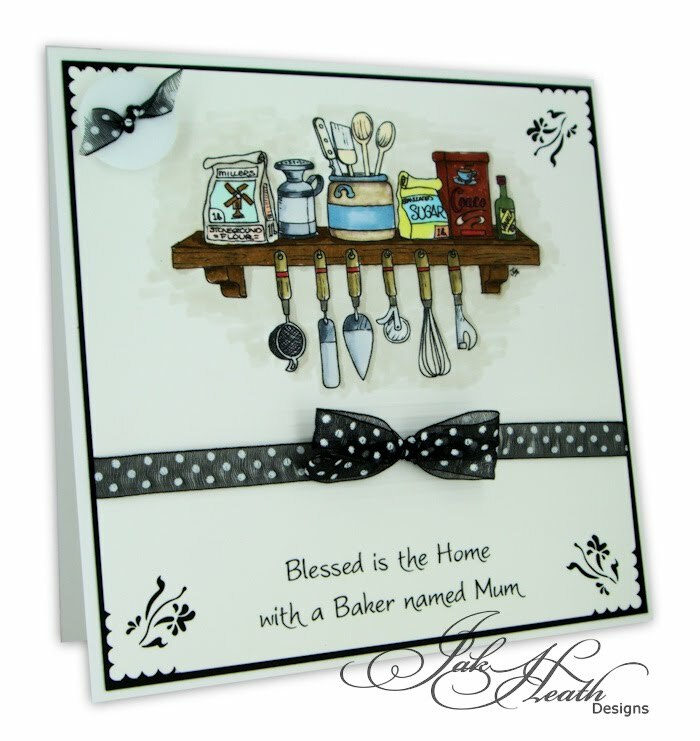 Love the image and style of your card. Fantastic card Jak and why did you share that ribbon and button site.... That's fatal.... Oh i am in heaven. Can't cook or bake to save myself.